Much has changed in the last 8 years in the world of SDR radios. Fast forward to 2016 and just about everyone in the hobby has heard the buzz word “SDR radio”. When SDRs first came out to the market they were all aimed at HF listening and you had two types to pick from. The first being soundcard based and the second being direct sampling. The price gap between the two were several hundred dollars. The more expensive being direct sampling. As the hobby progressed, so did the technology and the prices started to shift dramatically. 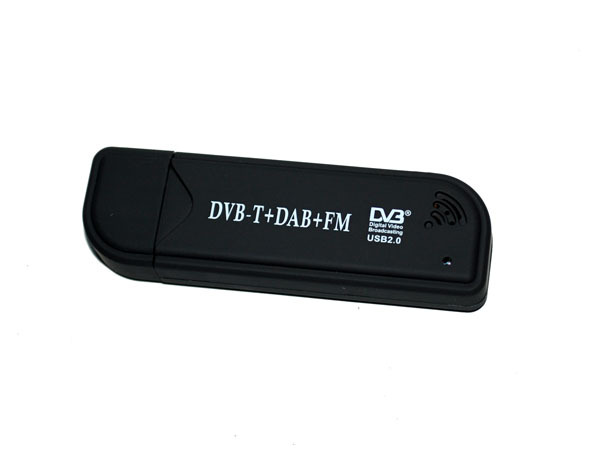 You can now purchase a TV dongle for $10.00 and turn it into a SDR. The Soft66RTL3 is basically a TV dongle but with a lot more features. The Soft66RTL3 comes from an engineer who is no stranger to the world of SDRS. Kazunori Miura (JA7TDO) has been designing and selling many models of SDRS over the internet and shipping them direct from Japan for about 7 years. The Soft66RTL3 is his latest of model hot off his bench. This SDR is a dual input RTL-SDR with a built in 50 MHz upconverter along with 4 user selectable band pass filters that greatly increase your signal to noise ratio in the HF bands. The frequency range of the RTL3 is from DC to Daylight (0.4 kHz to 1.7 GHz). Miura also addressed a heat issue with the previous version (RTL2) by adding a thermal pad and heatsink. RTL dongles are notoriously unstable due to overheating. In theory, the thermal pad should add frequency stability and keep drift to a minimal. 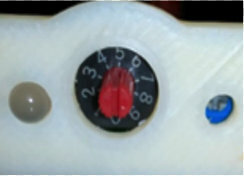 The last feature of the RTL3 is the input gain trimmer pot (see image above). The trimmer pot is for the HF side of the SDR and is already set before it’s shipped from Japan. If you would like to reduce or increase it the trimmer pot is easily accessible. I would suggest leaving it as is. The RTL3 is broken down into two sections: the HF input side and the VHF/UHF input side. 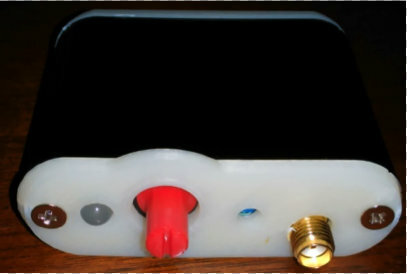 The HF side of the SDR (above) has a red rotary encoder and trimmer pot port. 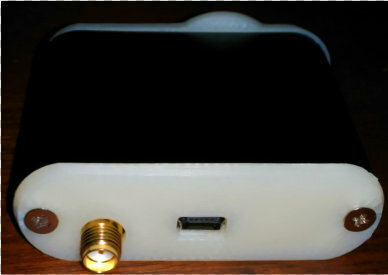 The VHF/UHF side (below) has the USB Mini-B connection. Both sides of the RTL3 terminate to a SMA-Male connection and Power comes from a single USB Mini-B cable. If you look at the rotary encoder (red cap cover) you will see a small notch window. The 12 o’clock position is #5 on the encoder dial. One click clockwise will take you to switch position #6 and one click counterclockwise will take you to #4. You should pull the red cap cover off to have a look and get your bearings. All other positions will bypass the filtering section on the HF side of the SDR. If you already have a RTL-SDR on your system then all you need to do is swap it out with the RTL3 and change the offset of -50,000,000 in HDSDR or SDR# to listen to the HF side of the RTL3–but if this is your first SDR we will need to install 2 items: the front end app and the driver. I will assume your system is Win-7 or better and we will be using SDR# as our program of choice to drive the RTL3. The RTL3 runs just fine in HDSDR and SDR-Console, but by choosing SDR# it will reduce our setup time considerably. 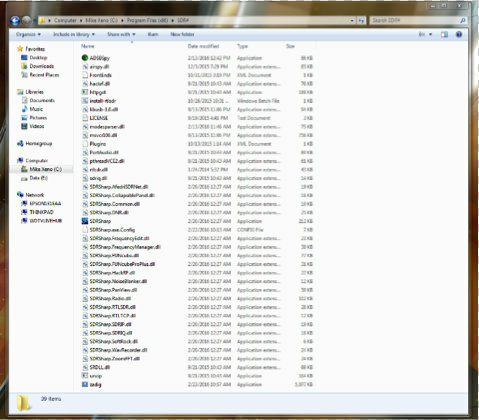 When you run the “zadig.exe” make sure you select “list all devices” as shown above. The RTL3 is now ready to be used and no further setup is required. I will assume you did not have any issues setting up the ZADIG driver and now move on to using the RTL3 inside of SDR#. I will show you real world conditions that are not from any scientific standpoint. Antenna wise, for the HF side I will be using a G5RV mini and for the VHF/UHF side I will be using a Scanntenna ST-2. You can now launch SDR# and check the following settings (see image below). For the VHF/UHF side of the RTL3 you will want the rotary encoder on position #9. You want the cutout in the encoder cap showing the 5 o’clock position. I have been using this SDR for a little over 3 months. Out of all the low cost SDR’S on the market, this one gives you the most bang-for-your-buck and it is a great entry level SDR with some “Pro” features. The Soft66RTL3 price is $40.00 US shipped–click here to order. Mike, thank you so much for this excellent overview of the Soft66RTL3! I’m especially appreciative of the time you’ve taken to explain the installation process–for many, this is one of the more difficult RTL-SDR learning curves. 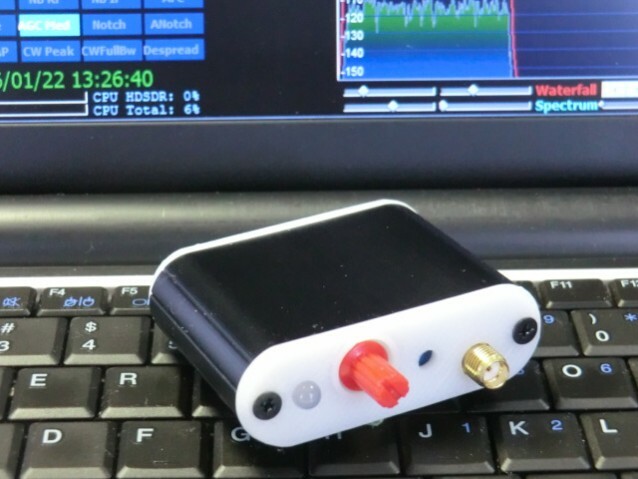 I’m very tempted to check this out for myself–I love the fact that this little SDR has bandpass filters. Post Readers: I suspect Mike will monitor the comments in this post, so feel free to ask questions. Make sure to check out Mike’s website, where you’ll find more articles about software defined radios. 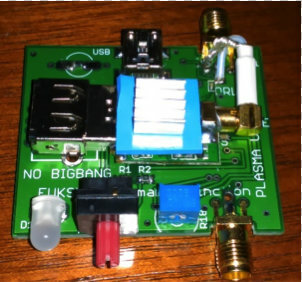 This entry was posted in Deals, Ham Radio, Manufacturers, New Products, News, Portable Radio, Radios, Reviews, Shortwave Radio, Shortwave Radio Reviews, Software Defined Radio, Tutorials and tagged $40 SDR, Cheap SDRs, How To Install Soft66RTL3 SDR, Kazunori Miura (JA7TDO), Mike Ladd, Portable SDRs, SDRs, Soft66RTL3, Soft66RTL3 SDR, Soft66RTL3 SDR review on April 8, 2016 by Thomas. Using the RTL2832U $20 SDR for HF & trunk-tracker scanning? Here’s a website that has a lot of info on cheap SDR gear. They have a write-up on an external board which adds HF capabilities. I have one but haven’t done anything with it yet. Thanks, Jeff! Has anyone tried HF with any success? I’m curious how well this über-cheap receiver will cope with adjacent signals and blowtorch stations within the HF spectrum. Wow! Two $20 USB SDRs and a little PC magic could yield a trunking scanner? I want to hear more about this. Trunking scanners tend to be both expensive and complicated. If a web-updated database could be downloaded and used to control this sort of rig, the possibilities would be most impressive! 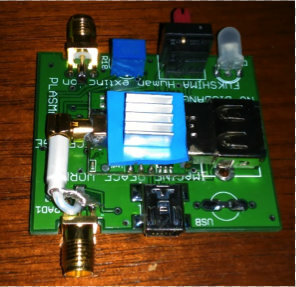 This entry was posted in How To, Radio Modifications, Radios, Software Defined Radio and tagged $20 SDR, $40 SDR, Cheap SDRs, Cheap Software Defined Radios, RTL2832U, RTL2832U SDR, SDR, Software Defined Radio, UHF, VHF on July 8, 2013 by Thomas.